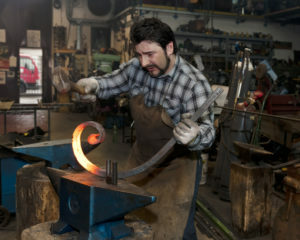 Dean-Wilson Iron is keeping the craft of blacksmithing alive in Brisbane. This centuries old tradition has come a long way over time however the fundamentals of this craft are unchanged. This is exactly what a blacksmith does, and how a modern blacksmith can create a unique masterpiece for your home. What is the role of a blacksmith? A blacksmith is a person who traditionally works with metal, shaping it into a range of useful items and decorative shapes. Blacksmithing, a highly skilled trade, it not as commonly seen today as it was historically yet those who perform the role not only command respect for their work but also high prices for their rather unique services. Blacksmith is a word made up of the words ‘black’ and ‘smith’. The ‘black’ refers to the layer of black oxides that form on the metal, or iron, during the heating of it. And the ‘smith’ is a common term for someone who works with metal, such as goldsmith. So a blacksmith is a ‘smith’ who works with ‘black’ metal or iron. Census records report many who noted their occupation as a blacksmith. In fact, this is one profession that has been performed for many, many generations. Historically, a blacksmith would have been responsible for making a wide variety of items. In medieval times these could have included swords, arrowheads and even shields. Further down through time, the need for tools, nails, door hinges, locks and keys were all made by hand – something we now take for granted and head to a hardware store and purchase straight off the rack. A blacksmith was also highly regarded as the go-to person when it came to repairing farm implement and still to this day, they have a knack at being able to pull crowds. People are fascinated at the manual work involved in turning iron into a creative masterpiece and even in the process of making horseshoes. Blacksmithing is currently enjoying a renaissance with the unprecedented popularity of Game of Thrones and Brisbane playing host to the largest Medieval Festival in the Southern Hemisphere, The Abbey Festival near Caboolture. The tools a blacksmith uses are relatively simple and still very much resemble those used many years ago. Surprisingly not much has changed. It’s the skill in their hands and individual’s ability, which is what is so highly sort after. An anvil, or a block of iron is the foundation upon which the pliable hot metals are shaped. Using tongs to handle the metal and a variety of hammers for shaping and finishing the designs, punches for making holes and a range of other equipment for refining the metal, a blacksmith cleverly moulds, bends and designs something that can never be replicated with the same precision and quality with a machine. Today a blacksmith is fortunate to have easy access to a range of materials and more affordable heating methods and despite the fact that the traditional role of a local, community blacksmith has all but gone, it has taken a slight detour and re-created itself as a highly specialised, and well recognised profession. Whilst we no longer call upon a blacksmith to make items that are now readily available, a modern blacksmith will produce unique, fine art pieces that cannot be sourced elsewhere. Wrought iron furniture and gates, balustrades and even creative masterpieces that add a wow factor to a home or building can be made outside of a commercial factory. Hand-made versions stand out. Those in business today, like Dean-Wilson Iron, who are proud to continue working in this very old craft with a long tradition, are helping to reignite the wonder of this profession. What makes blacksmithing such an amazing profession too is that the history, heritage and craftsmanship carried down from generation to generation has not been lost. Keeping the craft alive is more than melting and moulding metal. It’s about imparting passion and spirit into a piece of unique work that would never be created in a factory. If you are looking for a wrought iron feature for your Brisbane home, and love the creative options that a Brisbane blacksmith can design, give Dean –Wilson iron a call. You’ll not only be able to design your own unique furniture but become the owner of a timeless piece that is bound to turn heads. For all your wrought iron furniture, gates and fences, contact Dean-Wilson Iron in Brisbane and see first hand exactly what a blacksmith can create for you.